We have high speed internet in every Bungalow, also the ones in the forest, as well as the reception and restaurant area. 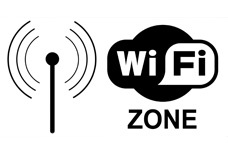 You can use the internet at the reception during opening hours (from 7.00 AM to 17.00 PM). If you need to print something just let us know. Any calls within Costa Rica you can make for free at the reception. 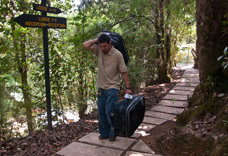 We offer a luggage service for our guests that have a Bungalow further in the forest, for some bungalows are up to 350 meters from the parking lot. 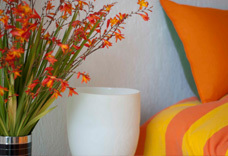 We bring all your suitcases for you to your Bungalow in case you arrive between 7.00 AM and 17.00 PM. When you leave, please warn the reception at what time you want to have your suitcases to be picked up, and we will leave them next to your car or bring them to the reception. In case of an early check in, with no Bungalow yet available, we will guard your luggage in our storage room so you can enjoy our trails or discover the valley in the meantime. Washing and drying. Ironing optional. Delivered before 11.00 AM ready before 17.00 PM same day. Delivered after 11.00 AM ready next day before 10.00 AM. In your Bungalow you can find a laundry bag to put your clothes in, and a check-list which you must fill and deliver together with the laundry bag at the reception. 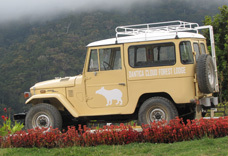 We offer transportation for our tours, and also to pick you up or drop you off at the entrance of the San Gerardo de Dota valley, along the Pan-American highway. Besides tours, transportation in the valley costs between 5.- and 25,- USD depending the distance. For transportation further away to any corner in Costa Rica please ask for the rates; you can reserve it in advance, mentioning it in the reservation form, or get more detailed information at the reception during your stay. If you want to take the lunch with you on a tour or walk, just let us know, we prepare delicious sandwiches or snacks to take with you. The lunch package costs 9.50 USD per person, a snack 4.50 USD. We can also prepare it for you to take with you on our trails. 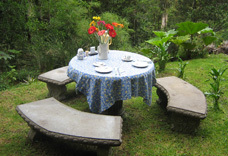 There are several tables along the trails where you can enjoy it.